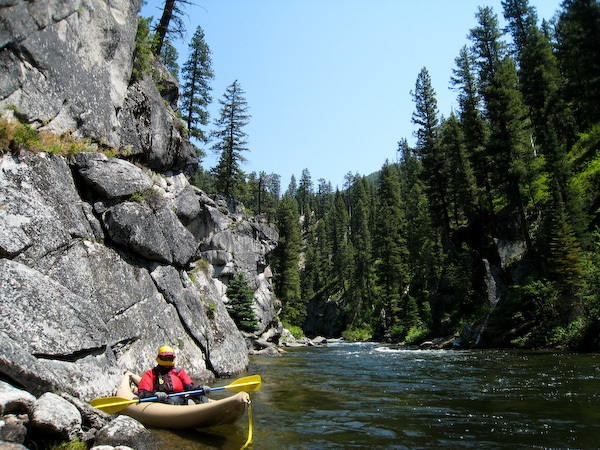 The fabulous inner gorge of Idaho's Deadwood River. Ah, the Deadwood. This run has been of interest to me for years, but it's a long way to go for one trip from Seattle. It was on the hit list for our road trip, but after a few interesting days, the commitment required to pull this run off was scarce as we settled into a relaxing vacation pace. Our trip began with a visit to the ranger station in Lowman. We poured over maps and conferred with the rangers to detail a route that allows us to access the putin. 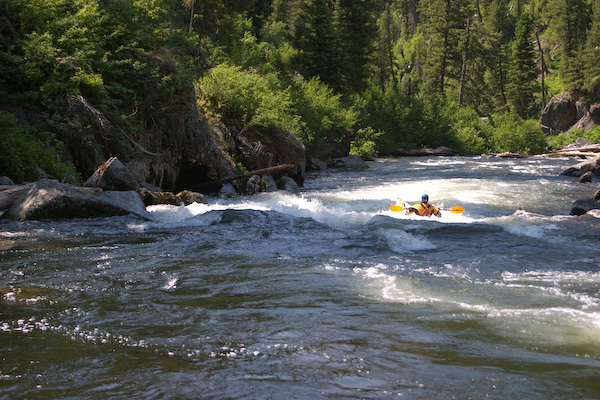 The route takes us from the Payette drainage, up through the headwaters of the MF Salmon, and down below the Deadwood Reservoir. 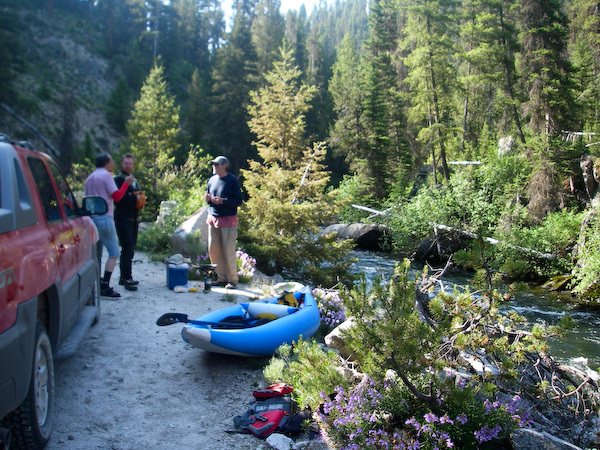 We were lucky to meet up with David Chatham, Eric Klein, and Mark Yauney, who were also boating throughout Idaho at the time and wound up sharing our campground. Given the 2+ hour one way shuttle, any one-day plan for this trip would require heroic shuttle efforts. 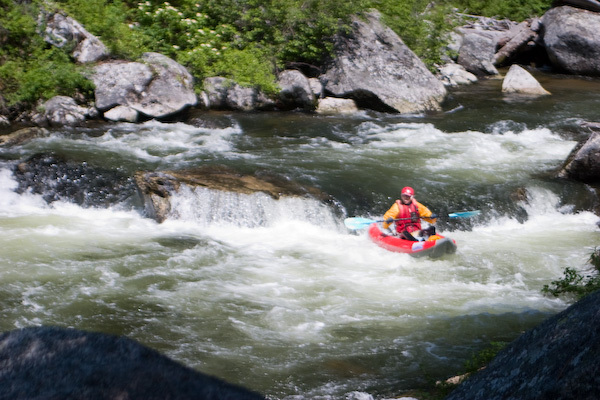 Taking a major hit to help the rest of the crew out, Bart and Mark volunteered to spend a day off the water, instead logging a brutal 5 hour shuttle that made this trip possible. Thanks a ton guys! David and Eric decided to join us for this harebrained attempt. David also deserves props as he probed much of the day, which had to be a nerve wracking experience. He kept us moving quickly, and did an all around fantastic job. 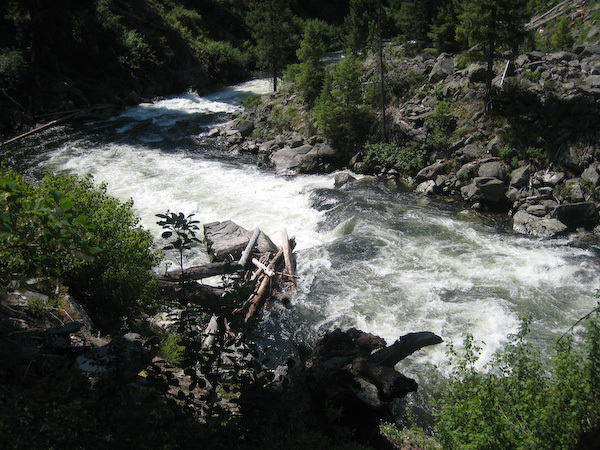 Beta on the Deadwood suggested we were approaching at low flows of ~500 cfs. 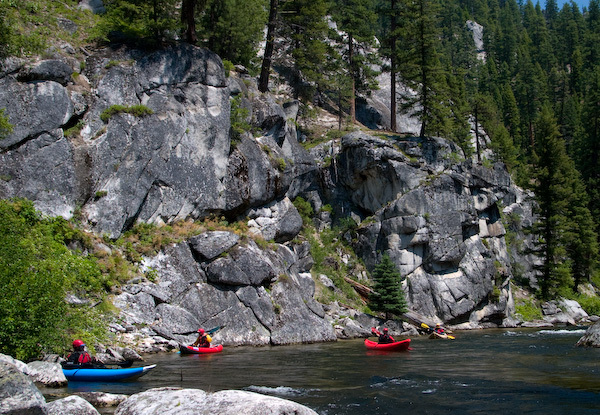 We figured this to be of benefit, given that none of us had ever been on the run before, and we faced 25 miles of IV paddling with some harder drops and unknown wood portages mixed in. Eric and I just launching. We quickly reached our first wood portage in the first 5 minutes. A hike down the trail on river left would have given us warning of this strainer. While not a bad one, there were no eddies or places to land. An ominous reminder to our group to be on our toes for wood. 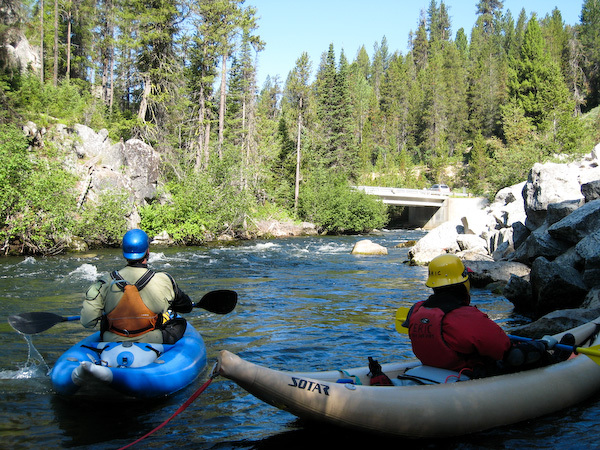 We encountered perhaps 3 total portages before coming to our first significant IV rapid. The first real rapid we came to featured an innocuous entrance into a 4' broken ledge. Wood blocked the left line on the entrance, requiring a very tight ferry. The ledge itself offered few places for a clean line. David ran it cleanly, but the rest of us portaged out of general wood paranoia. This would end up being the only clean thing we'd portage all day. This first ledge marked a change in the character of the river. 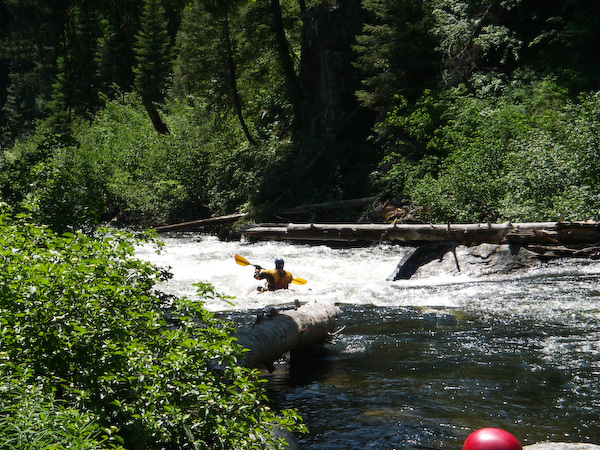 We were in a great section of pool and drop rapids, and while there was some wood in play, but there were also clean lines. Most of the signature big drops were log choked and unrunnable, but a few were in great shape. 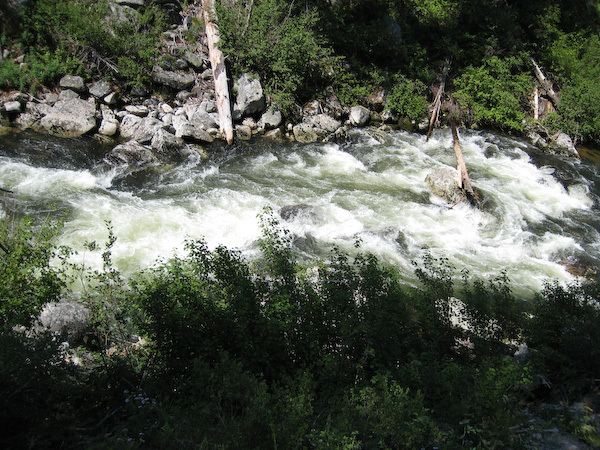 All the rapids looked like clean, multi-move IV+ drops at this flow, and would have had great lines sans wood. David probes the drop following the first ledge. 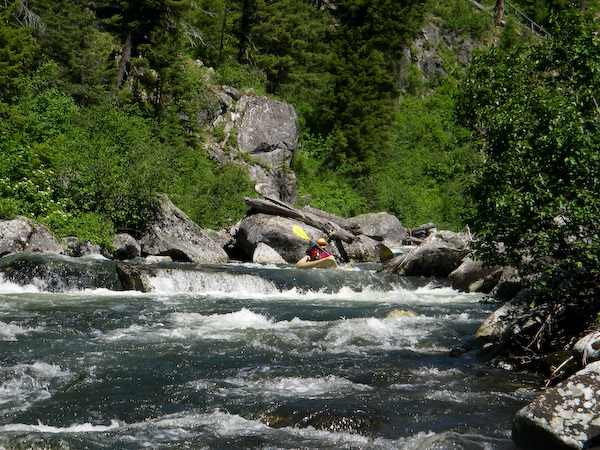 Eric, Nick, and Bill come through a great clean IV rapid in the upper canyon. David probes a typical Deadwood drop - wood in play. This was definitely the woodiest section of the run. We found rapid after rapid requiring portage, due only to wood. Despite the portaging, we were settling into a good rhythm. 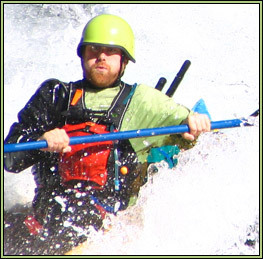 We knew we still had the toughest set of rapids to negotiate, but we were making good time, and communication and pace were flowing well. 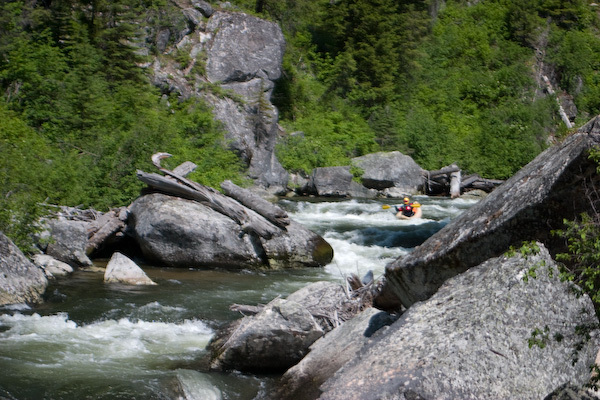 The rapids eased briefly and we entered a short but stunning beautiful inner gorge of towering cliffs and calm water. For me, this is why I love boating. 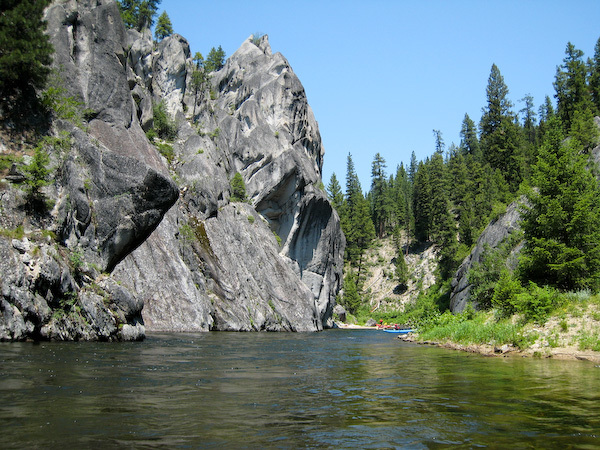 Here we were, floating a pristine inner canyon, that could barely be accessed in any other way. Roads or trails don't take you near here, the only egress is in your boat. 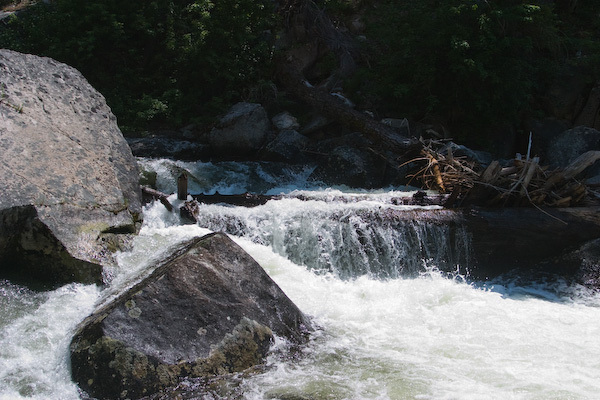 The rapids and portages are but the price of admission to a place this wild and untouched. Somewhere in the heart of this section, we came around a calm corner and startled a feeding black bear sow and cub. The sow took off up the hillside, as did junior. But after the first 2 boats drifted on by, junior decided we weren't threatening and made his way back to the river bank and resumed tearing apart a carcass at water's edge. Not 20 minutes later, we startled a female elk with another young 'un and got to watch them scamper out of sight up a steep ravine. 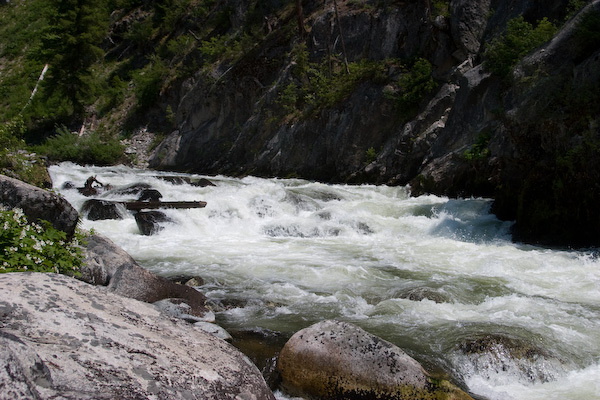 The rapids began to pick up again and we were quickly coming into the last section of IV-V rapids. 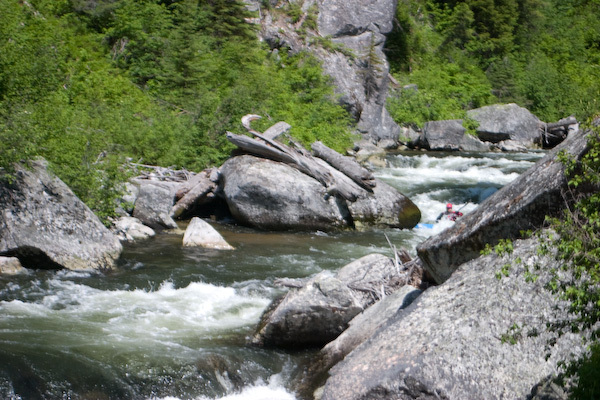 We had reason to believe the biggest rapid on the run was in this section, and that it was probably wood choked. Another wood choked drop. 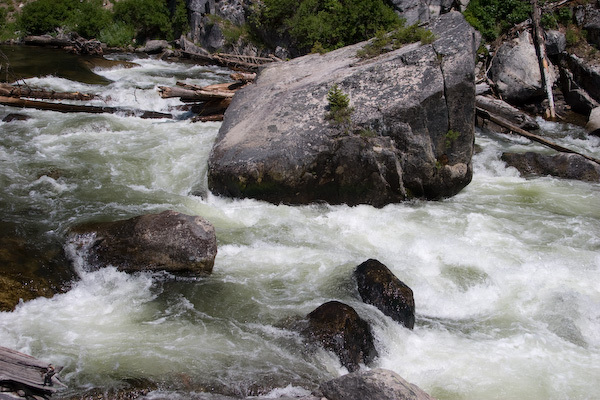 False alarm as the big V, this is the last big rapid above the crux drop. After another portage or two, we were working our way through a little class II entry move, when David, probing up front, suddenly make a sketchy exit into a tiny micro eddy. He signaled us to stop and portage down the left bank. This was the crux drop, and had startled David with a hidden cat's cradle of logs blocking the runout of a ledge. We eventually ended up portaging down the right. The rapid featured a pair of ledges up top, before dropping you into a beefy channel against the left wall with some backed up holes at the bottom, complete with a woody final ledge guarding the exit and awaiting any swimmers washing out of the meat above. The runout of the big drop, below the wood, but above the exit ledge. 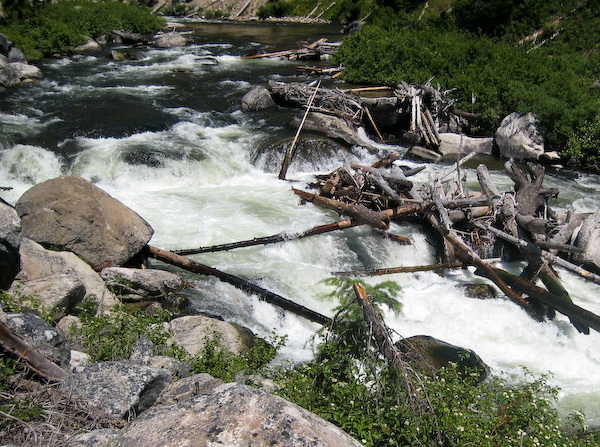 Below this portage, the Deadwood offered several miles of clean boogie. We enjoyed lots of continuous III-IV in a lovely canyon. 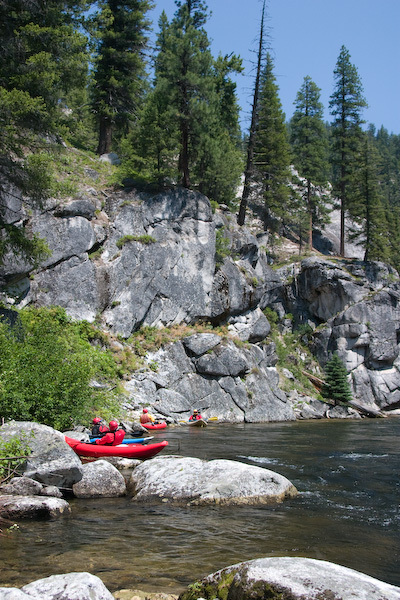 There was no wood, no scouting, no portaging, no photos -- just laughter echoing off the canyon walls as we enjoyed miles of quality read 'n' run technical water. Eventually the fun had to end. 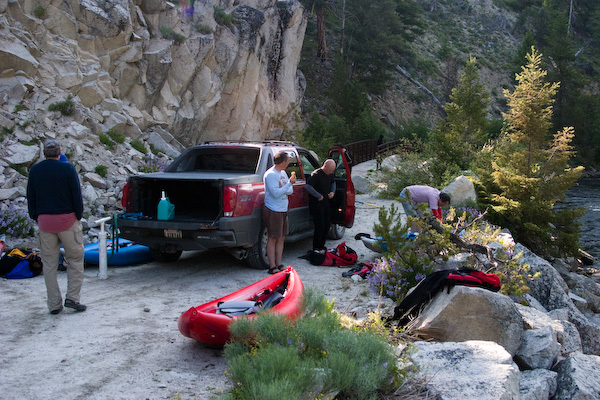 We came around a corner in the runout of a long III rapid and saw the road bridge and campground. We stopped for lunch and enjoyed a brief feeling of success at making it this far - 15 miles under our belts. The campground would make an excellent overnight camp for a group with more time to spend on this run. Below the bridge, the Deadwood changes character somewhat. The road doesn't stay near the river for long, and the bedrock walls are replaced with dirt hillsides. It becomes easy to see why the road is in disrepair as the hillsides are full of active slide zones. After a short mellow section, the lower Deadwood comes alive with several more miles of continuous III-IV. 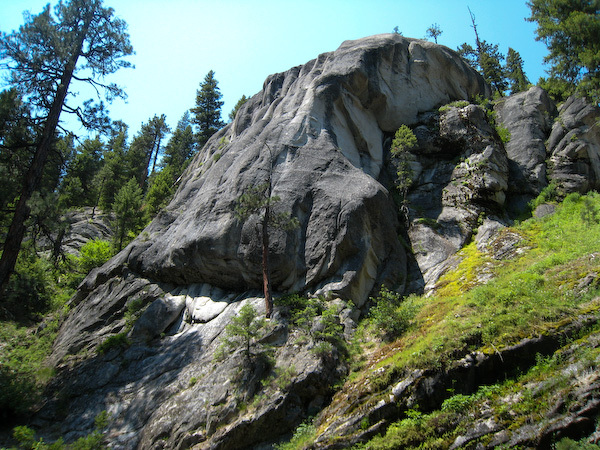 These boulder gardens are a bit more constricted than those in the canyon above, but in a wider riverbed. Almost all are clean, though the remnants of a massive logjam are visible part way down. Plenty of wood still present, but here the river is wide enough that most logs won't block the river. Everyone found this to be a fun and stress free section after the wood and portages of the upper canyon. After the quality boulder gardens ease, we found ourselves on a lake. Yup, you know what that means: an old obstruction! We were in the remnants of a lake created by a huge logjam. The water had clearly been higher in the past as many trees near the water had been killed. Once we reached the outflow of the lake, we scouted as best as we could. It was clean as far as we could see, so David and I dropped out front to see what was around the corner. David and I worked our way through some serious mank and blind wood. We came careening around a corner and I hit a lucky brace to avoid a swim just above more wood. We had found the blown log jam, and it hadn't gotten far. David working through the wood choked braided channels below the blown out logjam. 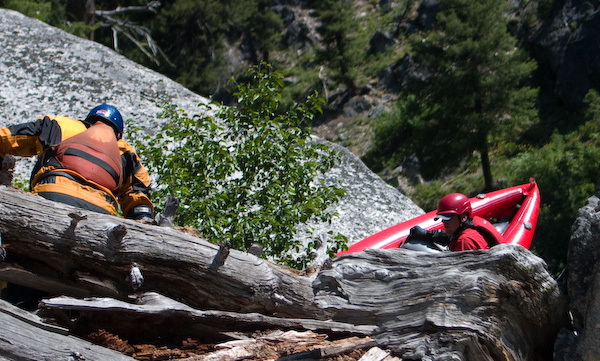 Once we had the crew collected and around the worst of the wood, we were back on our way. 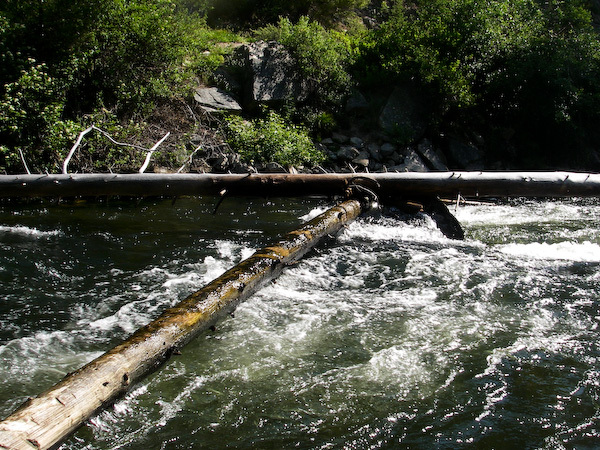 We were close to the end of the run, and we continued to see the remnants of the log jam over the last mile or two. Suddenly we were floating next to the road, and we knew we'd pulled it off! All in all this was a highlight of 2008 for me. A stellar wilderness run with a little bit of everything. It's a mixed bag, sure, and I don't think I'd want to be in there with 2x the water, but the Deadwood is a wild and challenging place to visit. I look forward to my next opportunity to see that wild inner gorge. Thanks to Shaun [SR] and Bill [BT] for sharing pix!